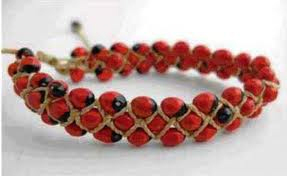 A bracelet made of Jequirity Beans (Peas) has been on sale from outlets across the UK including the Eden Project in Cornwall and there is a health issue in relation to the bean if chewed. There is no information to suggest that this is on sale across Aberdeenshire but these could have been purchased while on holiday in other parts of the UK (e.g. Oxfam have sold these in the past).